The Salem Red Sox announced a series of roster moves on Thursday, highlighted by the promotions of infielder Mauricio Dubon (pictured, right) to High A Salem from Single-A Greenville and the previously-reported promotion of Sam Travis from Salem to Double-A Portland. Joining Travis on the move from Salem to Portland are catcher Jake Romanski and left-handed reliever Williams Jerez. The club also moved David Chester to the DL to clear roster space. Coming up to High-A from Greenville along with Dubon will be outfielder Derek Miller and catcher Jordan Procyshen. All three are active for Thursday night's game. Infielder Deiner Lopez has been transferred to Single-A Greenville from Salem. Dubon, a 26th-round pick in 2013 out of Capital Chrisitan High School in Sacramento, CA, is ranked a the 18th prospect in the system on SoxProspects.com. Dubon excelled in Greenville this season, hitting .301/.354/.428 with 12 doubles, three triples, and four home runs. A contact hitter with some speed, Dubon swiped 18 bases in 22 attempts. Dubon made his second All-Star team in two seasons with his selection to the South Atlantic League team; he was a New York-Penn League All-Star in 2014, hitting .320/.337/.395 in 66 games for the Spinners. A month away from turning 21, Dubon will be about 2 1/2 years younger than the average South Atlantic League player. The middle infielder was ranked 23rd in the Sox system by Baseball America. Dubon's .301 average ranks as second among regulars in Greenville, and he leads the team in stolen bases. Portland will be the fifth stop in just a year and a half for Jerez (pictured, left), 23, originally drafted in the second round in 2011 as an outfielder. He was converted to a pitcher last season and posted a 2.88 ERA in 34 1/3 innings between the Gulf Coast League and Lowell. 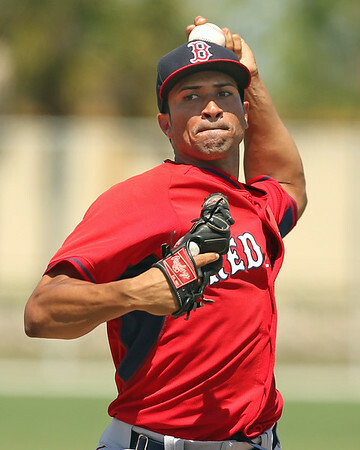 Jerez, ranked as the 51st best-prospect in the system by SoxProspects.com, had just been promoted to Salem on June 6, and allowed just one earned run in five appearances (12 1/3 innings), good for a 0.73 ERA. He posted a 2.06 ERA striking out 43 batters in 39 1/3 innings in Greenville in 2015. Romanski, the organization's 14th-round pick in 2013 from San Diego State University. The 24-year-old hit .269/.328/.370 over parts of two season in Salem, and is tied for third on the team with 21 RBI in 47 games this season. He's committed just one error behind the plate in 2015, fewest among regular Carolina League catchers. He's also allowed just one passed ball and thrown out 38-percent of base stealers. He is 57 on SoxProspects.com's rankings. Lopez was promoted to Salem on May 19 and hit .271 in 14 games. Signed as an international free agent in 2010, the 21-year-old spent two full seasons in Lowell and hit .267/.323/.433 in 18 games for Greenville this season. After the promotion of Manuel Margot to Double-A a few days ago, Salem was in need of an outfielder. Miller was drafted in the 23rd round in 2014 and hit .281/.387/.359 in 54 games for the GCL Red Sox in 2014. His numbers in 63 games in Greenville this season were nearly identical, slashing .283/.385/.329 with 32 walks compared to 35 strikeouts in 285 plate appearances. Miller, 22, rounds out the top 60 prospects for SoxProspects.com, and started in left field in the South Atlantic League All-Star game this season. His .385 OBP is best among Greenville regulars. Procyshen was chosen in the 14th round in 2014 and hit .285/.356/.363 in 51 games for Greenville this season. He's thrown out 33-percent of base stealers this season, and was also a representative for the Drive in the SAL All-Star Game as the starting catcher. He currently sits at 44 in the SoxProspects.com rankings.